It’s a well-known fact that turkey has many health benefits over other meats like ham and chicken. Just one 3.5 ounce serving has 30 grams of protein, so you can feel full and satisfied enough to participate in your family’s Turkey Bowl! To keep this lean protein a healthy meal, use plenty of spices to give it flavor, and try avoiding using a lot of butter or fats. Who knew that something so delicious could be so good for you? These tubers have large amounts of fiber, beta-carotene, and vitamin C–even more than white potatoes. So, indulge your sweet tooth by having a scoop of sweet potato casserole–but try not to add too many marshmallows! 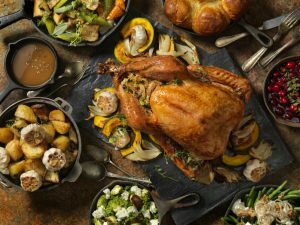 Bread stuffing is great, but it has a lot of extra calories and added sugars that can wreck your healthy eating goals. Instead, try this wild rice stuffing! The rice is hearty and full of fiber, and still has a huge amount of flavor. Did you know pumpkin is good for your teeth? Beta-carotene and other vitamins help strengthen your enamel. And, pumpkin is versatile enough that it can work with both sweet and savory dishes. Try going on the sweeter side with this souffle–add cinnamon, which can help reduce stress, and get to baking! Skip the green bean casserole this year and go for garlic and lemon green beans! With a fraction of the calories, this recipe has a ton of flavor, and they’re super easy to make. So, there you have it! Try these great recipes, and enjoy the flavors without worrying about your physical or dental health. Of course, if you need help improving your smile, give Dr. Postol a call today! Whether you need a dental cleaning, teeth whitening, or tooth restoration, he is the Ballwin cosmetic dentist for you!